I know you are missing me, because I am missing you too! Luckily it is almost NaBloPoMo, National Blog Posting Month... aka November. I will be back with my yearly daily challenge for the whole month. You might even get tired of me. The 23rd of Tishri is the day after Simchat Torah. The day after Sukkot ends. The day after the chagim are over for this year. There are no holidays until Thanksgiving. So it's time for me to return to regular blogging. Or, just putting up pictures and hoping that you don't notice my lack of posts because of how cute my kids are. This guy is 10 months old. He now has one little tooth. Oh, and he can walk. At least 10 steps in a row. The other kids get so darn excited when he does it that he falls down from the delight in their excitement. Eventually everyone will get over it, right? Check out this handsome devil. These are his "handsome clothes" (his words) that he wore for the holidays...he is doing so well with kindergarten, I'm so impressed. Every day he comes home with a new Spanish word (he's in a dual-language program) and he can count to 40 in Spanish. Plus, he's a total comedian. My pony-tailed girl-child has a million ideas every day. She wants to keep wearing her flip-flops even though it's really too cold and she refuses to wear a coat. She "reads" books out loud in her own foreign language and she tells stories in the shower. "Character" does not even begin to describe her and she is soaking everything up all around her every day. Anyone for a haircut? Not this kid, who is so proud of his funky messy hairdo. No amount of bribery seems to be working to get him to contemplate a new look. Good thing he is very handsome even without a comb. He came home from the first week of school with the joyous announcement that fourth graders can take out "as many books as they want" from the school library. (Previous grades, obviously, had a limit.) He is testing this rule as often and as much as possible. So that's what's going on in our family. How's your post-holiday life going? 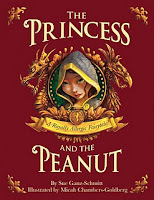 The Princess and the Peanut is a great book for children with peanut allergies and many other allergies because it makes them laugh when they find out that the doctor tested the princess with dragons, three blind mice, and witches. It can also be a good book for kids who don't have allergies because it helps them learn more about allergies. I have a friend that is allergic to peanuts and other stuff and she always has to carry around an epi-pen. 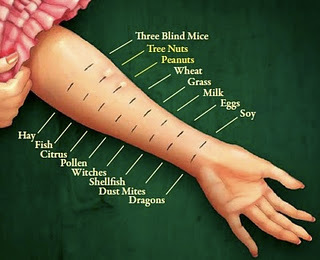 I am careful about who I eat peanuts around (even though I don't eat a lot of peanuts or peanut butter) so I don't accidentally hurt my friend. The pictures in the book are hilarious. I think the book was great. I agree with David, the book is really lovely. 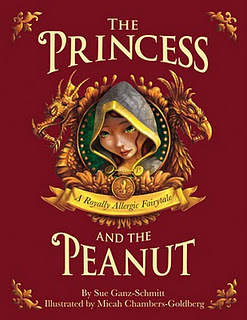 We have a "peanut free" school and I think this kind of book would be perfect in our school library (I'm going to donate it to them, actually) because while there are many kids with allergies, there are also many children who don't have them and who feel "inconvenienced" by the school policy (don't get me started). This book could be very helpful to creating additional empathy amongst the children (and their parents!) for the necessity of the school policies. When David was younger, the school sent home a survey that we were asked to fill out with our children. The purpose was to see if the kids understood why we had a peanut ban in our school. I was so impressed that David actually did understand, in particular about not wanting to hurt his friend who is allergic. To me, sending a soy-nut butter sandwich is a small price to pay to make sure that someone else is safe. This book would be a great addition to every school library. Do you want your mom to interview you for her blog? It's fine. Hi, everybody who is reading this! Can you tell me your favorite thing about your mom? That's your favorite thing about me? So what is your favorite thing about me? Okay, fine. New question. What is your LEAST favorite thing about your mom? You yell at me a lot. I'm sorry. I'll try harder to yell less. Why do you think that your mom keeps a blog? Because she likes to talk with her friends, and it helps her share her feelings when she's angry. If you could ask me anything you wanted, what would you ask? Could you let me build a go-kart? And then, buy some land and let me turn it into a private go-kart track? Do you like being the oldest kid? It has its perks. But when it comes to taking care of Sam and Yael...it is really boring. What is the best perk? Being able to stay up at night. Because they have the best technology and the best sci-fi that there is. Because there's a world outside the world that creates everything like a sunset with clouds made of hope and in the Department of Sleep they make bad dreams and good dreams and they make the noises of the night like snores and they send sleep in boxes. What is your favorite thing that your mom bakes? On-the-fence Brownies, which you haven't made for, like, ever. Can we make them tonight?